28S-DMH-113A is a ‘28S’ 4Ground model kit, ‘28S’ means it is highly detailed inside and outside with many pre-painted parts. This corner building Add-On fits between the roof and first storey (ground floor) of Rogan’s Bar. 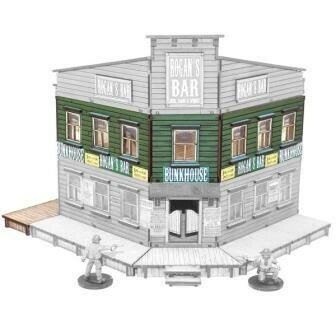 It also includes Dead Man's Hand Add-On 3 (staircase and boardwalk) within the pack. This Add-On has the same large windows as Rogan’s Bar its painted glass (acetate) advertising the bunkroom, also included is signage and posters relevant to the bunkhouse. After Jim Rogan’s murder his daughter Cathie did her best to make a go of the bar. With it’s prime location on a main street corner and a reputation for good beer, clean cards and fine whiskey, Cat managed to make some real good money. Three years after her father's death Cat had the bar extended up top with the addition of a bunk room. Rogan’s Bar and Bunkhouse is a favoured first option for many a traveller, familiar with stopping over in the town of Dead Man’s Hand for a few nights. It would seem life is good for Cat but she wouldn’t have got where she is now if she was a fool and she’s no fool; well aware there’s more than one set of covetous eyes looking to add Rogan’s Bar and Bunkhouse to their own boardwalk empire.